I apologize for posting in English, but it would take time to get it translated and I wanted to say -- I really like your idea! Also, you have prepared images, projects, a modified runtime, and many example projects, it's all extremely thorough. Thank you! We'll work on some things and get back to you soon. Nice to meet you Nate-SAN. It was good that documents were helpful. This animation-mix mode requires many animation-tracks. I'm happy if you can increase preview-tracks to about 10. Thank you for listening to my request. I'm looking forward to next version. The max could also be 20 or 25, but I'm not sure you ever need more then 15? Also, the + button turns additive on/off for the current track (it needs a new icon). AnimationState has seen a lot of improvements, using MixBlend.add is more efficient than MixBlend.replace. Only RotateTimeline has been updated so far, but the other timelines are the only work remaining! I wonder if additive for ColorTimeline (and TwoColorTimeline) would be useful? 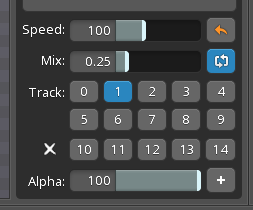 We've completed the additive track mixing in spine-libgdx and 3.7.06-beta has been released which has additive mixing in the Preview view for tracks >0. It's very neat! For people not clear on what is going on: all those animations are deforming a single mesh. Tracks with additive enabled are combining the animations on the same mesh. >The max could also be 20 or 25, but I'm not sure you ever need more then 15? I think that 10 to 15 is enough. If need more, (Game)Developers will make a debugging preview tool. I also think that "add,replace" is good. >I wonder if additive for ColorTimeline (and TwoColorTimeline) would be useful? There will be few opportunity to use, but I think that there is a meaning as a expressing possibility. About calculation method of color(and twocolor) mix, i have two kinds of ideas. I will add it to sample-program. Would you please wait a little while. Color mixing might be useful if RGB was animated on a lower track, and a higher track just wanted modulate alpha only. However, it would probably be better to allow keying alpha separately from RGB for that. Like when inheriting bone and attachment's color, i think It is easy to understand using multiply and scrren blending calculation. Unchanged/pass color , "color" is white , "tintcolor" is black. I think that "modulate alpha" will be able to do in this case.